"Let [Eunomias] first show, then, that the Church has believed in vain that the Only-begotten Son truly exists, not made such through adoption by a Father falsely so-called, but existing as such according to nature, by generation from Him Who Is, not estranged from the nature of Him who begot Him...And let no one interrupt me and say that what we confess should be confirmed by constructive reasoning. It suffices for the proof of our statement that we have a tradition coming down to us from the Fathers, an inheritance as it were, by succession from the Apostles through the saints who came after them." - St. Gregory of Nyssa (c. 335-95) Against Eunomius (Jaeger Wilamowitz-Moellendorf, Vol. 2, pp. 84-85). The thread in which it appears is entitled, Who invented Sola Scriptura? Since it wasn't that long ago that I posted a bit on Gregory of Nyssa, I was curious about this quote. I'm very tempted to say the quote come from Jurgens, although one finds the exact bibliographic information (from of all places) a quote from Robert Sungenis on the aomin website. In other words, I'm a bit suspicious if the person using it actually read the context. Let our author, then, show this to begin with, that it is in vain that the Church has believed that the Only-begotten Son truly exists, not adopted by a Father falsely so called, but existing according to nature, by generation from Him Who is, not alienated from the essence of Him that begat Him. But so long as his primary proposition remains unproved, it is idle to dwell on those which are secondary. And let no one interrupt me, by saying that what we confess should also be confirmed by constructive reasoning: for it is enough for proof of our statement, that the tradition has come down to us from our fathers, handled on, like some inheritance, by succession from the apostles and the saints who came after them. In the CARM thread, I briefly responded that what wasn't done by the use of this quote is define what is meant by "tradition." In the quote cited, Gregory is comparing an established position with "undemonstrated nonsense." He's saying if someone puts forth a new position without establishing it, there is no good reason to accept it. When it came to defeating Euonomius, Gregory does not appear to rely on some other infallible authoritative content as a means of argumentation. "Tradition," in the quote cited, does not contradict sola scriptura. To prove Gregory's statement is against sola scriptura, you've got to prove Gregory believed in another source of infallible truth by this statement. "Tradition" for the early Christian writers is usually referring to a basic, foundational outline of belief about God and Christ, or refers to practices and rites not doctrinal or dogmatic. One of my favorite recent blog posts is Turretinfan's What Gregory of Nyssa Considered Inspired. (By the way, Turretinfan appears to have considerably more time available on the Internet than I do!). Thanks for the post James. I have tried to think of a modern way we might do the same thing that we could communicate to the RC. As one in an LBCF church, we would use that "tradition" to settle disputes because we believe it comes from Scripture, and it is something we have believed traditionally for centuries. It seems to me that the use of "tradition" by the fathers at times is quite similar. Many children of the reformation misunderstand the role of tradition. This has added to the confusion among RCs, who generally refuse to understand even a basic understanding of Sola Scriptura anyway. Read the text. The great Saint compares the Tradition of which he speaks with that of the apostles themselves which has been handed down. "They, on the other hand, who change their doctrines to this novelty, would need the support of arguments in abundance, if they were about to bring over to their views, not men light as dust, and unstable, but men of weight and steadiness: but so long as their statement is advanced without being established, and without being proved, who is so foolish and so brutish as to account the teaching of the evangelists and apostles, and of those who have successively shone like lights in the churches, of less force than this undemonstrated nonsense?" He is obviously saying that the correct doctrines are handed down by tradition of the Fathers, and then he equates it directly with it being handed on by the apostles and their successors. He equates it as being one and the same. Looks cut and dry to me. All books are infallible. Not being persons, they cannot make mistakes. Did you mean inerrant? Did you mean something else? You are exactly right! What often happens is that one brings their presuppositions about the meaning of a term to the debate. So it is understandable that Catholics, who are currently taught that tradition “is distinct from Sacred Scripture” (CCC, para. 78) would bring that presumption to the table. However, J.N.D. Kelly notes that as early as Irenaeus and Tertullian there was a common conception of tradition and that was that it was the orthodox preaching of Scripture. “Tertullian[’s] …never contrasted tradition so understood with Scripture…For this reason, Scripture has absolute authority; what it teaches is necessarily true, and woe betide him who accepts doctrines not discoverable in it.” (Early Christian Doctrines, 5th ed., p. 39) Kelly also notes that Tertullian was in complete agreement with Irenaeus on this point. So Scripture was the sole, infallible rule for faith and practice in the early church in the time leading up to Gregory of Nyssa’s era. And tradition was the consistent, true teaching of it. So while, at the time of Gregory, there was a growing tendency to quote earlier fathers, the true tradition of the Church was to rely on their faithful exposition of the Scripture. For Gregory to have relied on some “esoteric” tradition outside of Scripture would have placed him in the camp of the people he was preaching against. Gregory realized, as you rightly note, that tradition is not, in the final analysis, what the Catechism of the Catholic Church teaches – “distinct from Sacred Scripture”. Church tradition is the faithful exposition of Scripture. Well, we can see that J.N.D. Kelly is clearly mistaken in this case because the text of Saint Gregory compares the tradition to what was given to him as the same that was given by the apostles themselves, which was passed down by succession. He also tells us in the text it is a method to determine correct doctrine. J.N.D. Kelly is not the all knowing sage of the historical Christian world. There are many scholars who of course disagree with his assessments. Look at the text itself. It is quite clear. "He also tells us in the text it is a method to determine correct doctrine." Saint Gregory here is telling us that there is a source other than Scripture that gives us correct doctrine. Not Scripture Alone. That is the point. Unless you're saying that Gregory is calling it infallible? What? Does he have to label it infallible? Do you think he was writing just to satisfy your personal insecurities? He tells us plainly that the Gospel is handed on from the Fathers, from the apostles through apostolic succession. That is the rule of faith he is going by here. Not by Scripture Alone. If he is going to appeal to an authority then obviously it has to be a reliable authority from which he is going to refute a heresy with, not one that is open to error. Rad the text. It amazes me that people will dance around the text because it does not agree with their theories. "Does he have to label it infallible?" The point is that you're trying to contrast what he says with Sola Scriptura. And it only disagrees with Sola Scriptura if he regarded this other source as being on the same level as Scripture. "So is that what you're saying? That this quote proves that Gregory regarded this other source as being on the same level as Scripture?" You responded, "Were the apostles infallible?" First, I take that to mean, "Yes". Right? I think you make a fallacius inference from what Kelly says about Tertullian. It doesn't follow from the fact that Tertullian never contrasted scripture with tradition that scripture was the sole rule of faith and that this rule was could be normatively applied by each individual and only so applied to his own conscience. The latter is Sola Sriptura but the former isn't. The Laudians for example held that Scripture was the supreme infallible and only rule, but they thought that the Church was the only infallible agent to apply the rule. And that isn't Sola Scriptura. Second, in the citation from Kelly, he notes that the the public teaching or preaching of the church which was the model of correct scriptural interpretation and this had normative weight. (Athanasius thinks the same btw) Hence the position that Kelly articulates of a normative interpretative model is what the Laudians and the Orthodox maintain. That isn't Sola Scriptura. Further, one can deny that tradition is normative in its own right and still deny Sola Scriptura especially for those positions that take scripture as part of that tradition. The tradition always has a derivative authority, especially for the Orthodox. Gregory doesn't teach Sola Scriptura merely because he holds Scripture to be supremely normative any more than the Laudians (who were the theological enemies of the Puritans) or the Orthodox do. Sola Scriptura entails much more than that Scripture is the only infallible rule, it is also a thesis about who can apply that rule and with what authority. To prove that Gregory taught Sola Scriptura, you'd need to prove that he taught the concept in its entirety and not just some of its necessary conditions. Here is some deductive logic. If the apostles taught the Gospel infallibly, and they in turn passed down the same teaching by apostolic succession to the Fathers as the great Saint says, then what was passed down to him by this tradition is also infallible. This is how the great Saint knows the teaching he received is authentic. It was not by Scripture Alone, but by this apostolic tradition, which later included the New Testament writings. Scripture in Tradition, not Tradition within Scripture. Again. Meaning... "Yes" to my previous question? I'm not asking you a trick question, or one that requires additional argument from you. It really is just a "yes, that's what I meant" or "no, that's not what I meant" question. And, by the way, I wasn't asking it in a, "Is that really what you think? *snicker snicker*" way. So... You really don't need to keep explaining why you think it, if that's what you were concluding. I wasn't asking for justification--just confirmation. I'll just assume that you did, in fact, mean "yes". If you didn't, then please say so. I followed your logic when you asked, "Were the apostles infallible?" --and then you laid it out explicitly. So. I partially agree with your logic. #2. If the apostles taught infallibly, and their students perfectly passed on that teaching (superintended by the Holy Spirit? ), then this Tradition would be an infallible source. #3a. If the apostles taught infallibly, and their students passed on that teaching with good human reliability (but not infallibly), then this tradition would be a source with some authority (though not infallible). As much authority as the transmission's reliability. #3b. If the apostles taught infallibly, and their students passed on that teaching unreliably, then this tradition would not be a very helpful source. #3c. If we have a chain of transmission that gets less reliable the further we get from the source, then the earlier stuff is more helpful, but never infallible like the original. And Protestants believe in something in the #3a-#3c area. With that in mind... It's clear that Gregory was at least thinking in terms of #3a. A strong #3a. But I don't see why we should think that he went as far as #2. You vividly portray a wide chasm between Christianity and Catholicism. The Bible clearly shows that man not only cannot do anything infallibly, as required by your syollogism, but also can only do evil. (Gen. 6:5) Jesus referred to us as dead (Matthew 8:22, Luke 9:60). Dead people cannot do anything infallibly! So your deductive logic rests on a factual fallacy – evil, dead men don’t do infallible things. So the fact that the Apostles, or Gregory or you or I have any true knowledge is, like everything else, a gift from God. One dead man teaching another dead man does not equal the truth. Constantine said, "The Bible clearly shows that man not only cannot do anything infallibly, as required by your syollogism, but also can only do evil." This is illogical. Since we know that man was the instrument used to write Scripture. Man did this infallibly by the inspiration of the Holy Spirit. If God can infallibly inspire man to write the infallible text of Scripture, then he can inspire man by the same guidance to transmit the Gospel by apostolic oral Tradition. Do you not know that the apostles taught infallibly without the aid of the New Testament? Your reasoning is flawed, not mine. Almost. If their students passed it down infallibly so that we can be certain that the teaching is the same, then it is an infallible source. So if "by apostolic succession" includes "infallible transmission", then you're right. But only if the transmission is infallible. For this quote--why do you think Gregory saw the transmission as infallible? I agree 100% with your last comment to Constantine. The church fathers could transmit the apostles' teaching infallibly, if the Holy Spirit guaranteed it. If the Bible taught that the Holy Spirit would guarantee the transmission of the apostles teaching, then Sola Scriptura would be wrong. I encourage those of you who are interested to take a look at Father Stephen's blog "Glory to God for All Things." He is addressing the matter of Tradition from the Eastern Orthodox perspective. I would think that since he is defending against erroneous doctrine that he is going to fall back on an infallible source of doctrine to refute it with, not an erroneous one. Once again he equates it with that of the teaching of the apostles, which as we all agree, are infallible in their passing on of the Gospel. Now return to some previous statements he made just prior to the ones you selected. "Now seeing that the CHURCH, according to the DIVINE TEACHING, believes the Only-begotten to be verily God..abhors..polytheism..doesn't admit the difference of essences..
that the CHURCH TEACHES this in plain language..how ought on who opposes HER DECISIONS to overthrow the preconceived opinion ? Tie this together w/ your quote. ..that the CHURCH has believed..Son truly exists,not adopted..not alienated from the essence of Him that begat Him..it is enough for proof of our statement..TRADITION etc. "Divine teaching" through the plain language (other Fathers/Creedal statements) of the Church's teaching. This meets the criteria offered by RCC in the Catchsm. #78&81 (for the sake of brevity). I suppose one could limit "divine teaching" to sola s. But this "plain langauge" excedes the text of scripture and is called tradition. One doesn't need to prove that Gregory held a source of doctrine outside Scripture to show that he didn't adhere to SS. The Laudians didn't hold to Sola Scriptura either but they thought that Scripture was the only infallible rule for faith and doctrine but that the church was the only infallible judge to apply the rule. So all that needs to be proved is that GRegory thought that every individual could be a normative judge only for himself and that the church could not bind the conscience and settle matters in a binding way with divine authority. Sola Scriptura is MORE than the thesis that Scripture is the only infallible source for doctrine. Yes, everyone does this to the point that words and letters no longer have meanings? If this is the case, what then is the point of relying on scriptures at all? After, does everyone not bring his/her presuppositions to the text as we see in Protestantism? Is it really not because of the problem you stated above that one can read St. Gregory’s words: “it is enough for proof of our statement, that the tradition has come down to us from our fathers, handled on, like some inheritance, by succession from the apostles and the saints who came after them”, and conclude the man was teaching Sola Scriptura? Do we have to suspend common sense and superimpose our presuppositions when dealing with matters of the ancient Church? This inheritance came "by succession from the apostles and the saints who came after them. What was handed down like an inheritance is the content of the faith/gospel and not some grandfather’s bible. 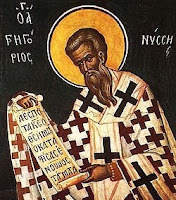 I can’t imagine that anyone gave St. Gregory any books from the apostles as his inheritance; what is not in doubt is that he received the teachings that came from the apostles, in context, through oral teaching. Matthew--are you using "erroneus" synonymously with "fallible"?